The Chancellor, George Osborne MP, has announced a £3million investment to help create a stunning new temporary exhibition space at the Museum of Science & Industry. Speaking at the official launch of European City of Science 2016 at the Museum, attended by the city’s leading science and business figures, the Chancellor set out further Government plans to prioritise science investment in the North West. This significant investment allows the Museum to take forward ambitious plans to convert the vaulted basement of its 1830 Warehouse – the first ever railway warehouse – into a venue for world-class exhibitions that will inspire the next generation of scientists and engineers. Director Sally MacDonald said: “This new exhibition space will allow us to deliver innovative exhibitions that will further enhance the city’s reputation for cutting-edge science. The Government’s invaluable financial support means we can do more to feed the enormous passion for science in the North West, serving our annual audience of more than 700,000 visitors and motivating more people to explore both the science and extraordinary heritage on offer at our Museum. The Chancellor has also recently announced plans for a major new research centre in Manchester. The Sir Henry Royce Institute for Advanced Materials Research and Innovation will be based at the University of Manchester. It will build on two centuries of innovation in developing materials that has underpinned Manchester’s rise as one of the first globalised industrial cities. These inventions, celebrated in the Museum’s collection, range from Richard Arkwright’s spinning frame (1775) to the creation of Terylene, the world’s first wholly synthetic fibre (1941), and the isolation of graphene just a decade ago. The £3 million Government investment in the Museum is in addition to an £800,000 grant that funded preparatory work, including the selection of the best location for the new exhibition space from across the its historic 7.5 acre site. It was at the Museum in June that George Osborne announced his intention to create a “Northern supercity” to rival London as a global hub by building HS3, a high speed rail link between Manchester and Leeds. The Museum’s major partnerships include the largest STEMNET contract outside of London and relationships with the Wellcome Trust and the University of Manchester with whom MOSI is working on a new exhibition on Graphene, Manchester’s latest global scientific export. This exhibition will open at the Museum in June 2016. I’m in Singapore for a few months and thought NW Fed members might like to hear about some of the museums in the city. My wife, who is a scientist, is working here for six months and I had just come to the end of a couple of big projects at Sheffield Industrial Museums Trust, so decided to take the opportunity to experience life in the tropics. Singapore has a wide variety of museums, historical sites and attractions, large and small, with all kinds of subject matter. Unfortunately for me, the National Museum is undergoing a major refurb, and the main galleries are closed until next year. To make it worse, two of the best nature reserves – Bukit Timah and Sungei Buloh Wetland Reserve – are also closed for maintenance and repairs to paths etc. However, I won’t let it get me down, because there are lots of other places to visit and learn from. As Christmas is approaching fast, I thought that the Mint Museum of Toys would be an appropriate place to start. 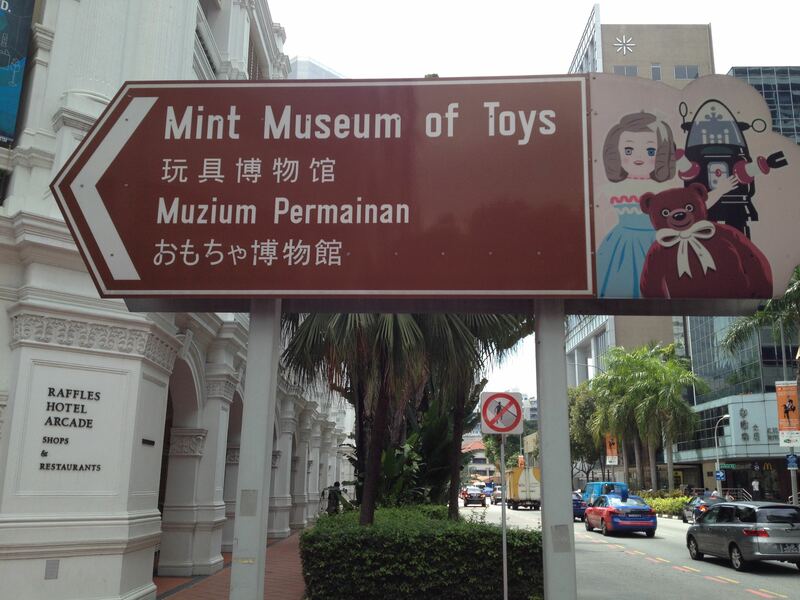 The Mint Museum of Toys claims to be “the world’s first purpose-built toy museum”. The name is an acronym: Moment of Imagination and Nostalgia with Toys. The collection is international and dates from the mid-1800s to the mid-1900s. I’m generally suspicious of nostalgia, but I confess that I found myself searching for toys from my childhood and remembering how I coveted my best friend’s bat-mobile! Although it is signposted, the Mint is quite difficult to find. It’s a narrow contemporary building in a terrace of bars and restaurants and at first glance just looks like another bistro. Nelly Ng, the Retail and Merchandise Manager, told me they have commissioned some large enamel signs in the shape of characters that will be posed outside ‘walking into the museum’. I think this will definitely help. Admission is relatively expensive at SG$15 (about £7.50) compared to the Singapore Discovery Centre at $10 and Asian Civilizations Museum at $8: both much larger venues. The galleries are on four floors, sandwiched between the museum’s Mr Punch Restaurant in the basement and Rooftop Bar above (both bar and restaurant display vintage enamel signs, some dating back to the 1880s – very hipster). The museum felt slightly claustrophic to me, perhaps because there are no external views once you are inside the building. Light levels are low as protection against fading, which makes it a bit tricky to see into the cases. I imagine it might be difficult for older people and visitors with visual impairments. The full height cases are packed with items grouped by type, date or country of origin. Rows of toy robots and cartoon figures mimic anthropology displays of tribal carvings or Egyptian shabti statues. 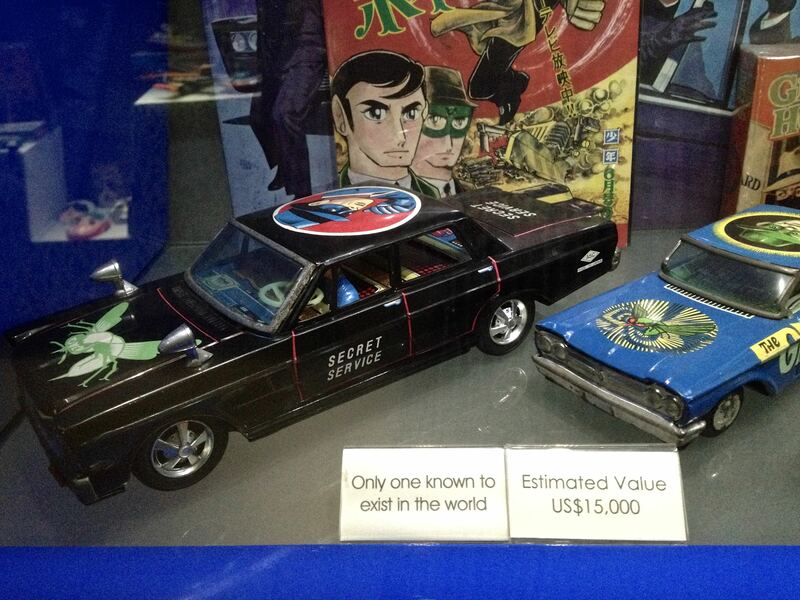 The rarest objects are highlighted, with estimated values in US dollars. A background soundtrack plays continuously: Disney songs, show tunes and other music chosen to create the right mood. Written information is sparse, which I liked – there’s too much reading in most museums for my liking – but, just to be contrary, I did feel the need for more context in this case. Triggering happy memories is the main purpose of the museum and it works. Nelly has lots of tales of inter-generational learning and enjoyment. But childhood isn’t always rosy. I think there is scope for more challenging interpretation that explores how toys interact with and reflect the adult world, and so, apparently, does the Curator. I spotted a J.F.K. doll in a rocking chair with the assassination front-page story. On the shelf directly above, Frankenstein puppets are accompanied by a bumper sticker that reads “Whoever has the most toys when he dies wins”. This thought-provoking juxtaposition isn’t accidental – I asked Nelly. The ‘golly’ display on the other hand is presented without commentary and surely needs it. I hope the Mint continues to encourage deeper engagement by expressing the dark side along with the light.